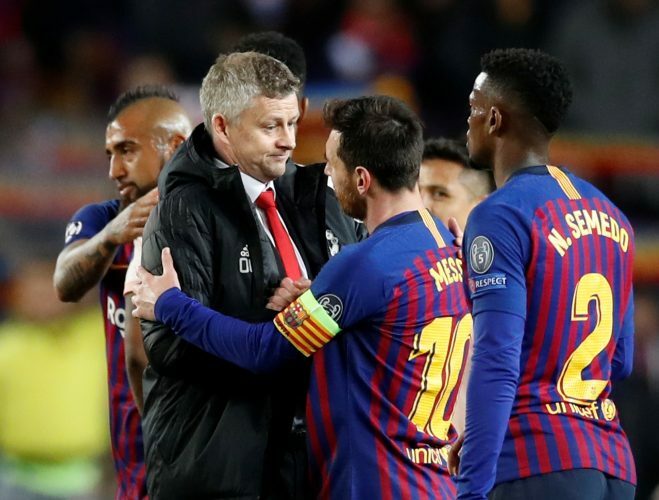 Manchester United were a team in shambles, as Barcelona thoroughly decimated them with a 3-0 win at the Camp Nou in the quarter-finals of the Champions League. Luke Shaw’s Old Trafford own-goal was added onto by a Lionel Messi brace, which was followed by a brilliant Philippe Coutinho goal to lead Barca into the semi-finals, where they will face either Liverpool or Porto. Left bloodied and battered at Old Trafford after a clash with Chris Smalling, Lionel Messi was touted to have nothing but revenge on his mind. Sure enough, powered by the Camp Nou faithful, the Argentine superstar slotted in two rapid goals. While it can be argued that both of his goals were practically gifted by Manchester United’s errors, his intent during the game was undeniable. In sharp contrast to the first-leg, the forward wasn’t defended well against. This was the sort of performance that pundits were anticipating at Old Trafford. At the end of the game, it is a real pity that he didn’t register a hattrick, as his 7 shots on goal were more than half of Barcelona’s entire attempts as a team. David De Gea wasn’t the goalkeeper Manchester United have been used to seeing. 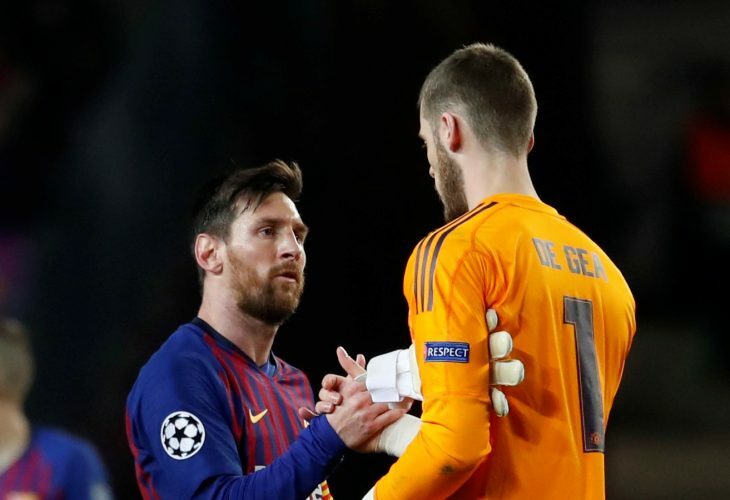 Both of Messi’s goals were from shots that De Gea has routinely saved in the past. In fact, the second-goal was purely a result of the Spaniard fumbling the ball. Even his sole moment of brilliance on the night seemed to appear as a mistake more than anything else. Meanwhile, he can be forgiven for letting in Coutinho’s goal due to the placement of the Brazilian’s shot. The writing seems to be on the wall for the shot-stopper. If Manchester United are unable to agree a new contract with him, he must be sold in the summer, as this distraction and lack of focus has already led him to make 3 errors that led to goals this season. Not a risk a club like United can continue to take. For a long time, the woe of a lack of a leader in the heart of their defense has plagued Manchester United. Against Barcelona, however, that dilemma seemed stretched out to the entire roster itself. Paul Pogba, expected to be the club’s golden boy for years to come, was once again invisible during a key game. Ashley Young, despite being the club’s captain, made the error which culminated in Messi’s opener and arguably started off the chain of poor results for the Mancunian outfit. The players lack severely in a leader-figure, and this is evident in their cluelessness on the pitch when faced with an organized opponent like Barcelona. This loss could certainly be a blessing in disguise for the Red Devils. The lucky win against PSG seemed to have temporarily quelled the obvious flaws prevalent at the club. Now, based on how the higher-ups at Old Trafford could view the situation, United may finally begin the process of repair. The difference between the two giants is obvious. Even at this advanced stage of the season, Barca have already secured De Jong, and are reportedly on the verge of signing De Ligt as well. In contrast, the Mancunian giants are only linked with many talents, but are yet to make the all-important decision of appointing a technical director. The summer just got a whole lot busier for the club. Philippe Coutinho has finally found his form, and he looks hungry for more. Multiple reports during the build-up to this clash were indicating that the Brazilian won’t be sold in the summer as was previously rumored. His spectacular goal and the subsequent celebration clearly pointed at his critics tells the entire story. In fact, this renewed vigor may have arrived at the perfect time, as the next Champions League opponents of the La Liga club will likely be Liverpool. That just happens to be his former club, and now, the stakes for the semi-finals are raised even further.